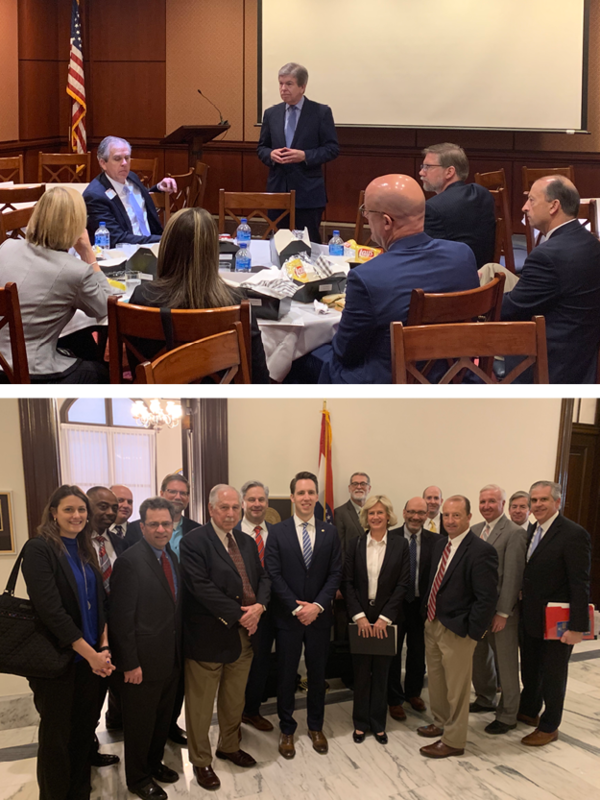 Missouri hospital executives and MHA staff discussed health policy issues with the Missouri congressional delegation in Washington, D.C., on April 9. Advocacy engagements included a joint briefing session for congressional offices and a conversation with U.S. Senator Roy Blunt. Senator Josh Hawley was only able to meet briefly because of an unexpected committee meeting, but Missouri hospital representatives reviewed policy issues with his lead health staffer. Topics included the pending Medicaid DSH allotment reductions slated to take effect Oct. 1, CMS’ management of “immediate jeopardy” and EMTALA citations in Missouri, legislation to regulate “surprise billing,” protecting the 340B drug discount program, and several other topics. MHA and a number of its member hospitals testified in support of Senate Bill 370 before a state Senate committee. The bill makes legislative changes to implement the MHA Board of Trustees’ advocacy principles for Medicaid managed care reform. MHA noted that there is little law or regulation on Medicaid managed care. Current standards largely are set by negotiated contracts between the Medicaid agency and the Medicaid managed care plans. Medicaid managed care is a substantial part of Medicaid, and the current focus on Medicaid reform should include the health plan vendors. The Missouri Health Plan Association testified in opposition, noting that the bill does little to contain Medicaid costs and would allow provider-sponsored coordinated care plans to evade the solvency and other regulatory standards imposed on Medicaid health plans. MHA has prepared a report illustrating the average Medicare spending per beneficiary by hospital, with comparisons to average spending for Missouri and the nation. The information includes details about the spending up to three days before admission, during the admission and up to 30 days post-discharge. The report is based on information released on the Centers for Medicare & Medicaid Services’ Hospital Compare website and uses data from Jan. 1 through Dec. 31, 2017. Policy and analytic studies, prepared for distribution by the Hospital Industry Data Institute, are available for download to authorized users of HIDI Analytic Advantage®. People who spend most of their waking hours sitting face heightened risks for many chronic diseases. They also often experience metabolic problems that raise the risk of diabetes and heart disease.